Please call us regarding availability before creating a notice with one of our conference rooms as the location. We will be able to accommodate your needs. However, due to the high demand of our court reporting and video services and conference rooms, we may have to use a conference room and address not listed on our website. 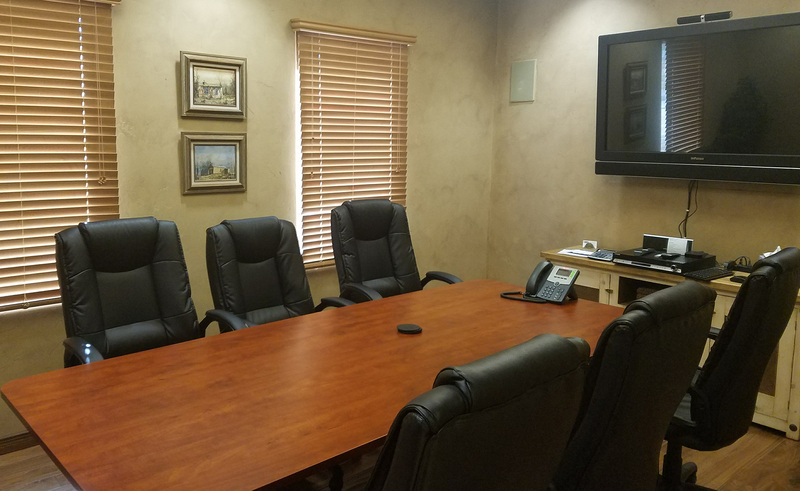 Looking for a court reporter, legal videographer, conference room space, or video conferencing in Las Cruces, NM? Established in 1997, Trattel Court Reporting & Videography provides full-service court reporting and litigation solutions for depositions and proceedings in Las Cruces, throughout New Mexico and surrounding states. We also cover all of South and Southwest New Mexico, including Alamogordo, Deming, and Silver City. Highly-skilled, licensed, friendly and dependable court reporters. In-house full-service legal videography department. The latest in legal technology and court reporting services. Multiple conference rooms with state of the art video conferencing equipment. "One call, that’s all. In town, out of town, Trattel is able to arrange everything for you. All you need is a date and location... Last minute, no worries, Trattel will do everything possible set up something up. Forget a detail, major or minor, Trattel will do their best to get you what you need for your deposition. The most friendly, dependable court reporters in the state. Go Green!" "Hands down the best court reporting service in town. They are always willing to help out with whatever they can. If you are in a bind, they are always there to save the day! I would definitely recommend their awesome services."